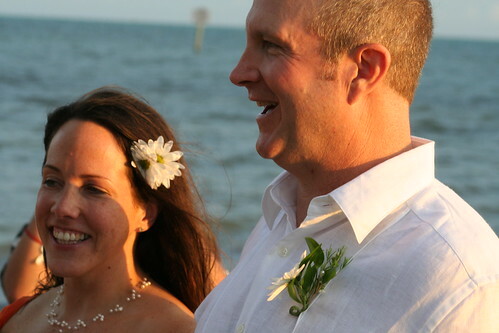 We went to Key West, Florida this weekend to celebrate the marriage of Brooke and Matt. I went to school with Brooke, and she’s been a good friend for many years. I’m absolutely delighted that she and Matt have committed their lives to one another, and I’m honored that she invited Carina and I to share the moment. Tom joined us on the flight down, and Amie and Duffy picked us up at the Fort Lauderdale airport Friday evening. We had an extremely long drive down US 1 to Key West, but much of the time was spent laughing and giggling that I will always remember it as one of the best rides I’ve ever enjoyed. Many jokes made that night will cause side-splitting laughter amongst us for a long time to come. We rolled into Key West around 11 PM, dropped our stuff into our hotel rooms and then set out to enjoy a few relaxing drinks. We connected with Brooke and Matt, and the relaxing notion slipped our minds. We stayed out late, and had considerably more fun that I would have imagined after a long day of travel. Saturday morning we woke up reasonably early and walked to Blue Heaven for breakfast. I’ve never dined with wild chickens walking around, so it was a unique experience. On the walk back we passed the Hemmingway house, but declined to pay the $11/person admission fee. We were all a little tired and worn-out from the night before, so we split up for a quick nap in our rooms before venturing out to the beach. We drove to Fort Zachary Taylor and enjoyed a swim, the sun, and a small bite to eat. After another brief nap, we cleaned up and climbed into the shuttle taking us to Brooke’s wedding. The weather was gorgeous, and the sunset was spectacular. The service was short, but very sweet. We watched for a bit as wedding photos were taken, and then climbed back into the van to go to the reception at Schooner Wharf Bar. It was a pleasant, cool evening filled with good food and good conversation. We stayed late, and walked with Brooke and Matt as they decided to continue the party at Capt. Tony’s Saloon. I was exhausted, so I dragged Carina back to the hotel with me. I don’t know how Brooke and Matt did it – they must have had only a few hours sleep all weekend! Sunday morning Duffy joined Carina and I for breakfast at Pepe’s Cafe, and then out for a snorkel trip. We had really wanted to go SCUBA diving, but settled for trying snorkeling. It was very windy as we went out, and there was a good deal of chop in the water as we jumped in. It took me a while to get the rhythm of the water so that I could swim without swallowing mouthfuls of seawater. It was a lot more exertion than I expected, and the water wasn’t quite as clear as I would have liked. Nonetheless, I had a good time. I saw a gigantic barracuda, nearly as long as I am tall, and a number of colorful fish. I spotted a large grouper, and turned my head to watch him swim away. When I turned my head back to look in front of me, I found myself staring at a large jellyfish less then two feet away! Carina didn’t enjoy snorkeling as much as I did. She never found a good way to keep water our of her mouth, and ended up feeling quite ill from swallowing too much of it. She only snorkeled for about half the time. On the plus side, though, she didn’t feel at all seasick on the trip to or from the dive spot! Usually Carina feels wretched, even with Dramamine, when taking a boat ride on choppy water. We had another short nap, and then reconnected with Amie and Tom for a late lunch. 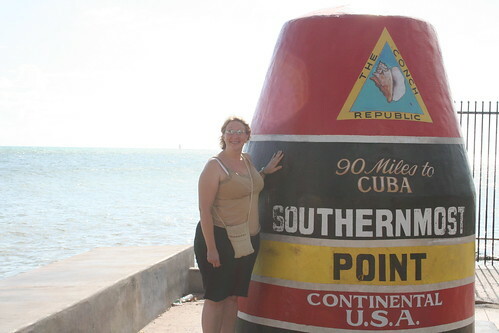 Afterwards we drove to the official southernmost spot in the US. We shared drinks at the Southernmost Cafe, and then made our way back to Mallory Square in order to join up with Brooke and Matt to watch the sunset. We never did connect with them, and we never did see the sunset (it was occluded by storm clouds off in the distance), but we did enjoy drinks along the water’s edge. Immediately next to us was Dominique’s Cat Show. This “cat show for cat people” was surreal, and we found ourselves captivated by how bizarre the whole thing was. I took a video with my Treo, but haven’t yet reviewed it to see if it’s of sufficient quality to make clear how weird the show was. You can try some of the YouTube videos of the Catman show to get a feel for it. We joined a large group of Brooke and Matt’s other friends for dinner at Red Fish Blue Fish, while Tom and Amie went on one of the walking ghost tours of the city. Afterwards, we all joined up again for a nightcap before retiring to our hotel rooms. We awoke early Monday morning, and made the long drive up US 1 to Fort Lauderdale. Again, we were able to make the drive entertaining (often by repeating the jokes from the drive down!) and made excellent time getting back to the airport. After a few uneventful flights, we were home. I liked Key West, but I’m not in any rush to go back. I had a superb weekend, in no small part due to the wonderful company of friends and loved ones. I hope Brooke and Matt had as much fun as we did, and I wish them a lifetime of happiness together!